(Phys.org) -- When an insect pierces the surface of a plant to feed, much of the action takes place in the plant's interior. A device called the Electrical Penetration Graph (EPG) is a critical tool for peering into the process. Now a new type of EPG developed by U. S. Department of Agriculture (USDA) entomologists is giving scientists the clearest view yet of the wars waged between piercing-sucking insects and the plants they attack. The EPG was developed by Elaine Backus at the Agricultural Research Service (ARS) San Joaquin Valley Agricultural Sciences Center, in Parlier, Calif., and her late partner William Bennett from the University of Missouri. ARS is USDA's principal intramural scientific research agency, and this research supports the USDA goal of promoting agricultural sustainability. 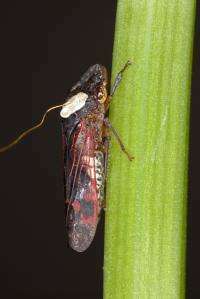 To use an EPG, researchers connect the insect and plant to an electronic monitor that reads electrical charges produced by changes in voltage that occur as the insect feeds. At least eight different systems have been developed, and researchers who study aphids and other piercing-sucking insects have used them over the years to publish nearly 400 peer-reviewed papers. But the new EPG is much more versatile than any of its predecessors, and is being used by researchers around the country in ways expected to broaden understanding of how plant-feeding insects cause so much damage. Traditionally, monitors have been designed to work with either AC or DC current. Because of the physics that govern electricity and the flow of electrical current, researchers have been likely to get best results using AC monitors when studying larger insects and DC monitors when studying smaller insects. Ideally, a monitor should be capable of studying a variety of insect sizes. As the name implies, the team's AC-DC Monitor incorporates design features from both AC and DC monitors, making it more versatile. Researchers can adjust the settings to the sizes of any insect they are studying. Entomologists will be able to view the feeding process in detail for more insects than ever before. They also will be better able to compare the feeding habits of pathogen-bearing insects with those that are pathogen-free. Backus and Bennett described the AC-DC Monitor in a recent issue of the Journal of Insect Physiology. More information: Read more about this research in the May/June 2012 issue of Agricultural Research magazine.